Elana Goodman joins with other protesters calling for women to be paid equally to their male co-workers on March 14, 2017 in Fort Lauderdale, Fla. 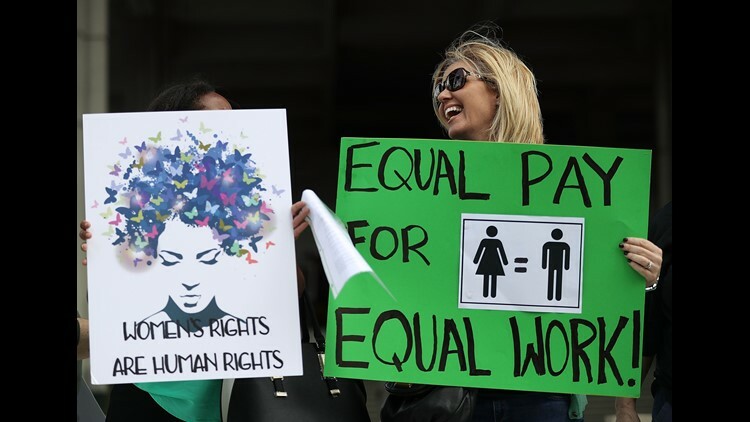 The protest was held as the legislation in the state of Florida looks at passing the Helen Gordon Davis fair pay protection act that would strengthen state laws in terms of equal pay. At its current pace of change, women will have to wait 100 years to earn the same pay as men, according to the American Association of University Women. On average, women are paid about 80% of what men are paid. To reach pay parity, women will have to wait until 2119, according to AAUW. If you are a woman of color, that gap is even wider. Tuesday is Equal Pay Day, a symbolic day for advocates in the U.S. to show support for women in the workforce and draw attention to the gender pay gap. It represents how far into the year women must work in order to earn what men earned the year before. It usually falls on a Tuesday, to show how far into the next work week women must work to match the pay earned by men, says the National Committee on Pay Equity. The NCPE says the event started in 1996 "as a public awareness event to illustrate the gap between men's and women's wages." The goal is not only to seek legislation to narrow the pay gap between men and women, but also for people of color. The AAUW is encouraging supporters to use social media to share the hashtag #EqualPayDay to lend their voices to the cause. The NCPE advises supporters wear red to show how far women are "in the red" on equal pay. What about women of color? According to AAUW, black women earn 63% of what white men were paid, while Hispanic women earn 54%. To put that in perspective, black women would have to work until August 7 of this year to earn what white men earned the year before. For Hispanic women, it's November 1.